Take a few steps off the beaten path with the 2019 Toyota 4Runner in Middletown, Connecticut. The design of the new 4Runner makes it the perfect all-weather, all-terrain SUV from Toyota. The updated 4Runner features all of the systems one could want for off-roading and cross-country road trips alike. When you need an SUV that lives up to its impressive off-road heritage, choose the 4Runner. The 4Runner features modern Toyota technologies and an array of trim levels. We encourage local drivers from to explore the new Toyota 4Runner SUVs at dealership in Middletown, CT. The new 4Runner features a 270-hp 4.0-liter V6 engine, which can enhance your driving experience. The 4Runner's potent comes with an available suite of traction-enhancing systems which allow this SUV to fulfill its off-roading duties. The SUV also features two available 4-wheel drive systems. These systems include a part-time 4WD with Active Traction Control and the full-time 4WD system. Toyota threw in the limited slip differential with a locking feature, making this SUV one for the ages. The 4Runner offers spacious two rows of seating as well as split-folding rear seats. 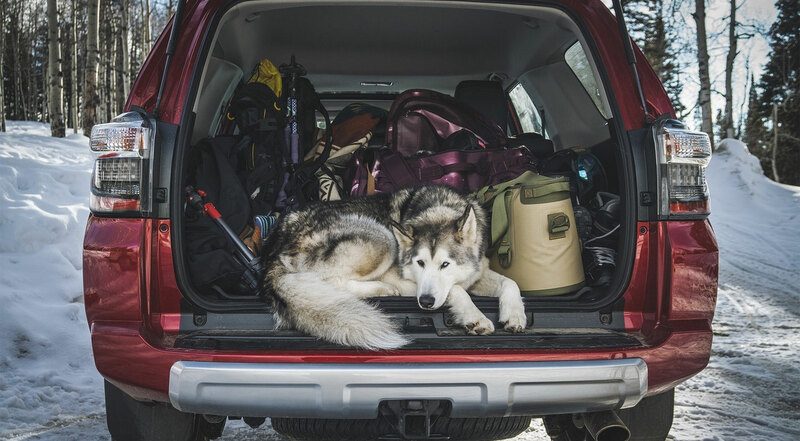 If you need to reconfigure your cabin to fit camping or sports gear, the 4Runner is the vehicle for you. The new 4Runner SR5 and Limited trims come with third-row seating for those who need added space. The available sliding rear cargo deck that extends over the rear bumper makes it easy to reach items when you're unloading the essentials. All and all, the 4Runner is one convenient vehicle. For over three decades, Toyota's 4Runner has been the vehicle showcasing all-terrain adventure. For the 2019 year, the 4Runner continues the tradition. Choose a new 4Runner equipped with stand-out features such as the Multi-terrain Select, which lets the driver choose four traction modes. If you plan on exploring different levels of terrain, you're going to love the 4Runner's crawl control feature. Crawl Control is a low-speed cruise control system used for navigating off-road surfaces. Craw Control works in conjunction with the Kinetic Dynamic Suspension System, which automatically adjusts the suspension to enhance wheel movements. Features like the available Smart Key System with push-button start, keep the drive convenient for drivers. The new 2019 4Runner comes with an Entune audio system which features a large touchscreen and a new rearview backup camera. Other features like the 120V AC power outlet make camping and tailgating at football games a reality. Choose the 4Runner! Interior Features: Air conditioning with air filter and second-row vents, Multi-Information Display (MID) with outside temperature, clock, average fuel economy and distance to empty, Fabric-trimmed front seats; 8-way power-adjustable driver's seat with power lumbar support; 4-way adjustable front passenger seat, Fabric-trimmed 40/20/40 split reclining and fold-flat second-row seat, Cruise Control, Leather-trimmed tilt/telescopic steering wheel with audio, Bluetooth® hands-free phone and voice-command controls, Optitron instrumentation with speedometer, tachometer, coolant temperature and fuel gauges; LCD display with odometer, tripmeters and average fuel economy; ECO Driving Indicator and warning messages, In-key remote keyless entry system, Power windows with auto up/down and jam protection in all positions, Power rear liftgate window with auto up/down and jam protection, Rear liftgate window defogger with timer and UV protection, Power door locks with programmable auto door lock logic, Backup camera with projected path, Overhead console with sunglasses storage, Center-console storage compartment with coin, tissue and pen holders, Gated shift lever with sequential shift mode, Two front, two rear and one cargo area 12V DC auxiliary power outlets, One cargo area 120V 100W/400W AC power outlet, Glare-resistant mechanical inside rearview mirror, Dual sun visors with illuminated vanity mirrors and extenders, Ten (12 on three-row models) cup and bottle holders, Foot pedal parking brake. Exterior Features: Projector-beam headlights with smoked trim, LED taillights with smoked sport trim, Integrated fog lights, Color-keyed front and rear bumpers, Heated power outside mirrors, Roof rails, 17-in. 6-spoke alloy wheels with P265/70R17 tires, Aerodynamic variable intermittent windshield wipers with mist cycle, Windshield wiper de-icer, Privacy glass on rear side, quarter and rear liftgate windows, Color-keyed rear spoiler with LED center high-mount stop light and integrated concealed rear wiper with mist cycle, Skid plates — on engine/front suspension, fuel tank and transfer case (transfer case on 4x4 models only), Front and rear mudguards. Interior Features: Air conditioning with air filter and second-row vents, Multi-Information Display (MID) with outside temperature, clock, average fuel economy and distance to empty, SofTex®-trimmed heated front seats; 8-way power-adjustable driver's seat with power lumbar support; 4-way power-adjustable front passenger seat, SofTex®-trimmed 40/20/40 split reclining and fold-flat second-row seat, Cruise control, Leather-trimmed tilt/telescopic steering wheel with audio, Bluetooth® hands-free phone and voice-command controls, Optitron instrumentation with speedometer, tachometer, coolant temperature and fuel gauges; LCD display with odometer, tripmeters and average fuel economy; ECO Driving Indicator and warning messages, In-key remote keyless entry system, Power windows with auto up/down and jam protection in all positions, Power rear liftgate window with auto up/down and jam protection, Rear liftgate window defogger with timer and UV protection, Power door locks with programmable auto door lock logic, Backup camera with projected path, Overhead console with sunglasses storage, Overhead console with Multi-terrain Select, Active Traction Control (A-TRAC), VSC cutoff, locking rear differential and Crawl Control (CRAWL) switches, HomeLink® universal transceiver, Center-console storage compartment with coin, tissue and pen holders, Gated shift lever with sequential shift mode, Two front, two rear and one cargo area 12V DC auxiliary power outlets, One cargo area 120V 100W/400W AC power outlet, Auto-dimming rearview mirror, Dual sun visors with illuminated vanity mirrors and extenders, Ten (12 on three-row models) cup and bottle holders, Foot pedal parking brake. Exterior Features: Projector-beam headlights with smoked trim, LED taillights with smoked sport trim, Integrated fog lights, Color-keyed front and rear bumpers, Heated power outside mirrors with turn signal indicators, Roof rails, 17-in. 6-spoke alloy wheels with P265/70R17 tires, Aerodynamic variable intermittent windshield wipers with mist cycle, Windshield wiper de-icer, Privacy glass on rear side, quarter and rear liftgate windows, Color-keyed rear spoiler with LED center high-mount stop light and integrated concealed rear wiper with mist cycle, Skid plates — on engine/front suspension, fuel tank and transfer case (transfer case on 4x4 models only), Front and rear mudguards. Interior Features: Air conditioning with air filter and second-row vents, Multi-Information Display (MID) with outside temperature, clock, average fuel economy and distance to empty, Fabric-trimmed front seats; 8-way power-adjustable driver's seat with power lumbar support; 4-way adjustable front passenger seat, Fabric-trimmed 40/20/40 split reclining and fold-flat second-row seat, Cruise control, Leather-trimmed tilt/telescopic steering wheel with audio, Bluetooth® hands-free phone and voice-command controls, Optitron instrumentation with speedometer, tachometer, coolant temperature and fuel gauges; LCD display with odometer, tripmeters and average fuel economy; ECO Driving Indicator and warning messages, In-key remote keyless entry system, Power windows with auto up/down and jam protection in all positions, Power rear liftgate window with auto up/down and jam protection, Rear liftgate window defogger with timer and UV protection, Power door locks with programmable auto door lock logic, Backup camera with projected path, Overhead console with Multi-terrain Select, Active Traction Control (A-TRAC), VSC cutoff, locking rear differential and Crawl Control (CRAWL) switches, Center-console storage compartment with coin, tissue and pen holders (carbon-fiber look), Gated shift lever with sequential shift mode, TRD shift knob, TRD Off-Road floor mats, Two front, two rear and one cargo area 12V DC auxiliary power outlets, One cargo area 120V 100W/400W AC power outlet, Glare-resistant mechanical inside rearview mirror, Dual sun visors with illuminated vanity mirrors and extenders, Ten (12 on three-row models) cup and bottle holders, Foot pedal parking brake. 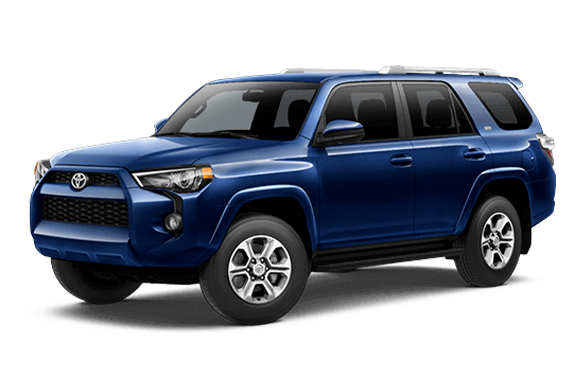 Exterior Features: Projector-beam headlights with smoked trim, LED taillights with smoked sport trim, Integrated fog lights, Color-keyed front and rear bumpers with silver accents, Heated power outside mirrors, Roof rails, "TRD Off-Road" external hard badges, 17-in. 7-spoke alloy wheels with P265/70R17 tires and black-painted accents, Aerodynamic variable intermittent windshield wipers with mist cycle, Windshield wiper de-icer, Privacy glass on rear side, quarter and rear liftgate windows, Color-keyed rear spoiler with LED center high-mount stop light and integrated concealed rear wiper with mist cycle, Skid plates — on engine/front suspension, fuel tank and transfer case (transfer case on 4x4 models only), Front and rear mudguards. Interior Features: Air conditioning with air filter and second-row vents, Multi-Information Display (MID) with outside temperature, clock, average fuel economy and distance to empty, SofTex®-trimmed heated front seats; 8-way power-adjustable driver's seat with power lumbar support; 4-way power-adjustable front passenger seat, SofTex®-trimmed 40/20/40 split reclining and fold-flat second-row seat, "TRD" red lettering on driver and front passenger headrests, Cruise control, Leather-trimmed tilt/telescopic steering wheel with audio, Bluetooth® hands-free phone and voice-command controls, Optitron instrumentation with speedometer, tachometer, coolant temperature and fuel gauges; LCD display with odometer, tripmeters and average fuel economy; ECO Driving Indicator and warning messages, In-key remote keyless entry system, Power windows with auto up/down and jam protection in all positions, Power rear liftgate window with auto up/down and jam protection, Rear liftgate window defogger with timer and UV protection, Power door locks with programmable auto door lock logic, Backup camera with projected path, Overhead console with Multi-terrain Select, Active Traction Control (A-TRAC), VSC cutoff, locking rear differential and Crawl Control (CRAWL) switches, HomeLink® universal transceiver, Center-console storage compartment with coin, tissue and pen holders (carbon-fiber look), Gated shift lever with sequential shift mode, TRD shift knob, TRD Off-Road floor mats, Two front, two rear and one cargo area 12V DC auxiliary power outlets, One cargo area 120V 100W/400W AC power outlet, Auto-dimming rearview mirror, Dual sun visors with illuminated vanity mirrors and extenders, Ten (12 on three-row models) cup and bottle holders, Foot pedal parking brake. Exterior Features: Projector-beam headlights with smoked trim, LED taillights with smoked sport trim, Integrated fog lights, Color-keyed front and rear bumpers with silver accents, Heated power outside mirrors with turn signal indicators, Roof rails, "TRD Off-Road" external hard badges, 17-in. 7-spoke alloy wheels with P265/70R17 tires and black-painted accents, Aerodynamic variable intermittent windshield wipers with mist cycle, Windshield wiper de-icer, Privacy glass on rear side, quarter and rear liftgate windows, Color-keyed rear spoiler with LED center high-mount stop light and integrated concealed rear wiper with mist cycle, Skid plates — on engine/front suspension, fuel tank and transfer case (transfer case on 4x4 models only), Front and rear mudguards. Interior Features: Dual zone automatic climate control with air filter and second-row vents, Multi-Information Display (MID) with outside temperature, clock, average fuel economy and distance to empty, Perforated leather-trimmed heated and ventilated front seats; 8-way power-adjustable driver's seat with memory function and power lumbar support; 4-way power-adjustable front passenger seat, Perforated leather-trimmed 40/20/40 split reclining and fold-flat second-row seat, Cruise control, Leather-trimmed tilt/telescopic steering wheel with audio, Bluetooth® hands-free phone and voice-command controls, Optitron instrumentation with speedometer, tachometer, coolant temperature and fuel gauges; LCD display with odometer, tripmeters and average fuel economy; ECO Driving Indicator and warning messages, Smart Key System with Push Button Start and remote illuminated entry, Power windows with auto up/down and jam protection in all positions, Power rear liftgate window with auto up/down and jam protection, Rear liftgate window defogger with timer and UV protection, Power door locks with programmable auto door lock logic, Backup camera with projected path, Overhead console with sunglasses storage, Overhead console with Multi-terrain Select, Active Traction Control (A-TRAC), VSC cutoff, locking rear differential and Crawl Control (CRAWL) switches, HomeLink® universal transceiver, Center-console storage compartment with coin, tissue and pen holders, Gated shift lever with sequential shift mode, Two front, two rear and one cargo area 12V DC auxiliary power outlets, One cargo area 120V 100W/400W AC power outlet, Auto-dimming rearview mirror, Dual sun visors with illuminated vanity mirrors and extenders, Ten (12 on three-row models) cup and bottle holders, Foot pedal parking brake. Exterior Features: Projector-beam headlights with smoked trim, Auto on/off headlight feature, LED taillights with smoked sport trim, Integrated fog lights, Color-keyed front and rear bumpers with chrome accents, Heated power outside mirrors with turn signal indicators, Roof rails, Chrome door handles with touch-sensor lock/unlock feature, Power tilt/slide moonroof with sunshade, 20-in. split 6-spoke alloy wheels with P245/60R20 tires, Aerodynamic variable intermittent windshield wipers with mist cycle, Windshield wiper de-icer, Privacy glass on rear side, quarter and rear liftgate windows, Color-keyed rear spoiler with LED center high-mount stop light and integrated concealed rear wiper with mist cycle, Skid plates — on engine/front suspension, fuel tank and transfer case (transfer case on 4x4 models only). Interior Features: Dual zone automatic climate control with air filter and second-row vents, Multi-Information Display (MID) with outside temperature, clock, average fuel economy and distance to empty, Perforated leather-trimmed heated and ventilated front seats; 8-way power-adjustable driver's seat with memory function and power lumbar support; 4-way power-adjustable front passenger seat, Perforated leather-trimmed 40/20/40 split reclining and fold-flat second-row seat, Cruise control, Leather-trimmed tilt/telescopic steering wheel with audio, Bluetooth® hands-free phone and voice-command controls, Optitron instrumentation with speedometer, tachometer, coolant temperature and fuel gauges; LCD display with odometer, tripmeters and average fuel economy; ECO Driving Indicator and warning messages, Smart Key System with Push Button Start and remote illuminated entry, Power windows with auto up/down and jam protection in all positions, Power rear liftgate window with auto up/down and jam protection, Rear liftgate window defogger with timer and UV protection, Power door locks with programmable auto door lock logic, Backup camera with projected path, Overhead console with sunglasses storage, HomeLink® universal transceiver, Center-console storage compartment with coin, tissue and pen holders, Gated shift lever with sequential shift mode, Two front, two rear and one cargo area 12V DC auxiliary power outlets, One cargo area 120V 100W/400W AC power outlet, Auto-dimming rearview mirror, Dual sun visors with illuminated vanity mirrors and extenders, Ten (12 on three-row models) cup and bottle holders, Foot pedal parking brake. Exterior Features: Projector-beam headlights with smoked trim, Auto on/off headlight feature, LED taillights with smoked sport trim, Integrated fog lights, Color-keyed front and rear bumpers with black chrome accents, Heated power outside mirrors with turn signal indicators, Roof rails, Black door handles with touch-sensor lock/unlock feature, Power tilt/slide moonroof with sunshade, 20-in. split 6-spoke alloy wheels with P245/60R20 tires, Aerodynamic variable intermittent windshield wipers with mist cycle, Windshield wiper de-icer, Privacy glass on rear side, quarter and rear liftgate windows, Color-keyed rear spoiler with LED center high-mount stop light and integrated concealed rear wiper with mist cycle, Skid plates — on engine/front suspension, fuel tank and transfer case (transfer case on 4x4 models only). Interior Features: Air conditioning with air filter and second-row vents, Multi-Information Display (MID) with outside temperature, clock, average fuel economy and distance to empty, SofTex®-trimmed heated front seats; 8-way power-adjustable driver's seat with power lumbar support; 4-way power-adjustable front passenger seat, "TRD" red lettering on driver and front passenger headrests, Cruise control, Leather-trimmed tilt/telescopic steering wheel with audio, Bluetooth® hands-free phone and voice-command controls, Optitron instrumentation with speedometer, tachometer, coolant temperature and fuel gauges; LCD display with odometer, tripmeters and average fuel economy; ECO Driving Indicator and warning messages, In-key remote keyless entry system, Power windows with auto up/down and jam protection in all positions, Power rear liftgate window with auto up/down and jam protection, Rear liftgate window defogger with timer and UV protection, Power door locks with programmable auto door lock logic, Backup camera with projected path, Overhead console with Multi-terrain Select, Active Traction Control (A-TRAC), VSC cutoff, locking rear differential and Crawl Control (CRAWL) switches, HomeLink® universal transceiver, Center-console storage compartment with coin, tissue and pen holders (carbon-fiber look), Gated shift lever with sequential shift mode, TRD shift knob, TRD Pro floor mats, Two front, two rear and one cargo area 12V DC auxiliary power outlets, One cargo area 120V 100W/400W AC power outlet, Auto-dimming rearview mirror, Dual sun visors with illuminated vanity mirrors and extenders, Ten (12 on three-row models) cup and bottle holders, Foot pedal parking brake. Exterior Features: Projector-beam headlights with smoked trim, Auto on/off headlight feature, LED taillights with smoked sport trim, Integrated LED fog lights , Color-keyed front and rear bumpers with black accents, Heated power outside mirrors, Roof rack, Unique "TOYOTA" front grille, Black "TRD PRO" external hard badges, Power tilt/slide moonroof with sunshade, 17-in. matte-black TRD alloy wheels with P265/70R17 A/T tires, Aerodynamic variable intermittent windshield wipers with mist cycle, Windshield wiper de-icer, Privacy glass on rear side, quarter and rear liftgate windows, Color-keyed rear spoiler with LED center high-mount stop light and integrated concealed rear wiper with mist cycle, Skid plates — on engine/front suspension, fuel tank and transfer case (transfer case on 4x4 models only), TRD-stamped aluminum front skid plate, Front and rear mudguards.